The total land base in Washington is 42,515,000 acres. Approximated 52% or 22,119,000 acres is considered forested land. About 36% is privately owned and 64% is managed by the government. Washington has some of the strictest Forest Practices Rules in the nation. Forest practices are practices related to growing, harvesting, or processing timber, including but not limited to, road construction and maintenance, thinning, salvage, harvesting, reforestation, brush control and using fertilizers or pesticides. These activities have been regulated since 1974 when the state first adopted the Forest Practices Act. The rules protect soils, water, fish, wildlife, and capital improvements (roads and power lines) from impacts related to forest practices on private, county and state forest land. The rules are enforced by the Washington Department of Natural Resources. Most forest practices require an approved permit from the WA DNR. Since 1974, Forest Practice Rules have been amended and strengthened numerous times. In 1999, the Washington Legislature adopted the Forest & Fish Law as a result of federal listings of endangered salmon and impaired water quality on non-federal forested streams. The Forests & Fish Law is an historic, science-based set of forest practices regulations that protect 60,000 miles of streams running through 9.3 million acres of state and private forestland. In 2006, the Forests & Fish Law was endorsed by the federal government, through a statewide Habitat Conservation Plan. As one of the largest and most comprehensive pieces of environmental legislation in the U.S., the law is designed to fully comply with both the federal Endangered Species Act (ESA) and the Clean Water Act (CWA) to protect Washington’s native fish and aquatic species. Once an area has been harvested, landowners usually reforest the area quickly, normally within 12 to 18 months, in order to get their next crop of trees established and growing before competing vegetation is a problem. Reforestation standards are dictated by the Forest Practice Rules. 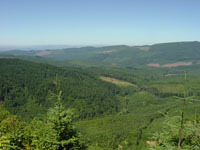 For example, in western Washington, at least 190 trees per acre must be established within three years of harvest. Most landowners plant between 400-500 tree seedlings per acre. On average, 3 trees are planted for each tree harvested. In 1971, state law excluded timber from property taxation. In place of a property tax on trees, timber owners pay a 5 percent excise tax on the stumpage value of their timber when it is harvested. In 1982, the Forest Tax was extended to timber harvested from State and Federal land, in addition to private land. The revenue distribution from harvested timber is split between the counties and the State general fund. The timber is taxed at five percent, with four percent distributed to the county where the harvest occurred and one percent to the state general fund. The county portion is distributed back to the county where the timber was harvested. It helps fund capital projects, voter-approved bonds, school maintenance and operations, county roads, libraries and fire districts. Washington State’s timber supply is primarily consumed by domestic sawmills producing lumber and other building products. In 2002, sawmills consumed about 61 percent of Washington’s timber harvest from combined ownerships. Ve­neer and plywood mills consumed another 11 percent. Poles and pilings, shake and shingle mills, and chipping mills producing chips for pulp mills consume another 6 percent. Pulp and paper mills also consume wood residues from saw­mills as well as recycled paper. The remaining 22 percent of the timber supply is exported as logs. These forest industry sectors compete to supply a domestic and global demand for forest products, mainly lumber and newsprint. Log exports have significantly declined as a percentage of Washington timber pro­duction since the 1990s, as a consequence of federal and state policy decisions, restructuring in the Japanese markets, global market competition and global financial changes. Meanwhile, the volume of timber going to sawmills has de­clined only slightly and has increased as a percentage of the declining overall timber supply. The vast majority of the lumber produced by sawmills within the state is sold to markets in North America. Major forest products competitors to Washington include Oregon, with its distance advantage to California markets; Canada with its distance advantage to the Midwest; and the U.S. Southeast, with its distance advantage to southern and eastern markets. In general, as supply has decreased from Washington timberlands, it has increased from the Southeast and from Canada. Despite the declines in harvest volume and sawmills over the past fifteen years, the forestry and forest products industries continue to make a significant contribu­tion to the state’s economy, particularly in rural, timber-dependent communities. Washington’s forest products industry is one of the most dynamic in the United States. Washington’s timberlands have the highest average per-acre yield of any state in the country. This contributes to Washington having the country’s second highest level of capital investment in wood products manufacturing. Washington ranked second and fourth among U.S. states in 2005 in the production of softwood lumber and plywood, respectively. Between 1994 and 2005, employment in sawmills actually increased from 7,721 to 8,565 as larger, more modern and efficient sawmills were built to replace those be­ing closed, and Washington producers shifted their marketing efforts from lumber exports to domestic lumber production. Since 1991, lumber production in Wash­ington increased by 58 percent, and Washington’s share of U.S. lumber produc­tion increased from 10.3 percent to 14.2 percent. A similar trend has occurred for plywood mills, with larger mills surviving, production per mill increasing 163 percent, and total production declining much less than the total number of mills. In fact, since 2001, Washington’s forest industries have played an increasingly sig­nificant role in the state economy, due primarily to a very strong U.S. housing market. Not only did this sector provide more than 45,000 jobs in 2005, it also generated approximately $16 billion in gross business income (GBI), and paid out more than $2 billion in wages. This sector accounts for about 15 percent of Wash­ington manufacturing jobs statewide, about 1.5 percent of total state employment, and about 3.2 percent of GBI within the private sector. Forestry and forest prod­ucts GBI as a percentage of total GBI within individual timbersheds climbs to 22 percent in the south coast timbershed and 15 percent in the southwest timber­shed. Similarly, forestry and forest product employment as a percentage of total employment is 8.5 percent and 6.9 percent in these two timbersheds, respectively. Annual wages are relatively high in this sector, averaging close to $50,000. Forests in the state provide important habitat for diverse communities of plants, fish, and wildlife. Forest-related animal species in Washington depend on a full range of forest conditions, from recent clearings to deep old growth forest. Old forests, which have declined significantly from pre-European settlement condi­tions, contain structural complexity important as habitat to some declining species, such as the northern spotted owl. Structural complexity includes comparatively low tree densities with larger trees, vertical layering of shrub and tree crowns, the presence of standing dead trees and down logs, the horizontal patchiness of closed and open areas, and the larger-scale patchiness of forests of different ages or species across a broad landscape. In addition to structural complexity, the pres­ence of streams, rivers, lakes, and wetlands increases the diversity of plant com­munities and habitat. In general, several trends have been affecting forest habitat. After decades of de­clines, almost all of the remaining old growth forests are being protected from harvest as a consequence of the Northwest Forest Plan on national forests, and the adoption of DNR’s Habitat Conservation Plan which provides protection for most of the modest amounts of old growth on state trust lands. Currently, about 13-18 percent of western Washington’s forest area is estimated to be in an old growth condition, 80 percent of which is on national forests. Although currently off-limits to harvest, these forests are nevertheless at risk from large wildfires, windstorms, and insect and disease infestations. Outside old growth areas, second growth forests in many areas have been increas­ing in age, sometimes reaching 80-100 years old or more, although not necessarily having experienced the natural disturbances which create complex structure. In other areas, younger second growth forests have been relatively unattended and have therefore become overcrowded with dense stands of small trees, in which little light reaches the forest floor, habitat value is low and in some locations sus­ceptibility to infestations of forest insect pests and disease can be high. Finally, industrial plantations may be intentionally managed to higher than natural densi­ties and harvested at a relatively young age, usually between 40-60 years. For all these reasons, forests with comparatively higher density than in pre-European settlement times are much more prevalent across the landscape. Almost all timber harvest is occurring in second and third-growth forests in Washington. Overall, across all Washington’s timberland in the 1980s and 1990s, forests gained in net volume at a rate of about 0.3 percent per year in the 1980s and climbing to almost 1 percent per year in the 1990s. This considers growth, minus natural mortality and timber harvest. The positive net volume gain was more than three times higher in western Washington than in eastern Washington in the 1990s, due largely to the increasing volume on federal acres as a consequence of the decline in federal harvests. In the 1990s, growth averaged 9.2 billion board feet per year across all ownerships, while harvest averaged 4.5 billion board feet per year, and natural mortality averaged 2.3 billion board feet per year, for a net increase of about 2.4 billion board feet per year. The picture varies significantly when looking at different ownership categories. Generally, on industrial lands, annual harvest plus natural mortality slightly ex­ceeded annual gross growth of 6.9 percent in the 1990s. However, using the most recent harvest figures since the 1990s and accounting for recent riparian harvest restrictions, net growth and removals have been about equal on industrial lands. On national forest lands, on the other hand, harvest is a much smaller percentage of total inventory, much less than 1 percent per year. But, because the older federal forests are growing much more slowly than the younger industrial forests, the net change on federal lands is still a fairly small annual gain. The greatest net annual gain in forest volumes occurs on state-owned trust lands and on non-industrial private lands, where relatively high annual growth rates exceed the rates of annual harvest and natural mortality, leading to recent net vol­ume increases of almost 2 percent per year on each of these ownership categories. For the most recent harvest rates, the net effect is almost 3 billion board feet of new net timber volume added each year across all owners. In many cases, this also reflects increased density in crowded second growth forests. One-third of the United States is forested—751 million acres. Sixty percent of all forestland in the U.S. is privately owned. Privately-owned forests supply 91 percent of the wood harvested in the U.S. State and tribal forests supply approximately 6 percent and federal forests supply only 2 percent of the wood used by the forest products industry. Over 25 percent of private U.S. forestland is certified to one of three sustainable forestry management certification systems: the Sustainable Forestry Initiative, Forest Stewardship Council, or American Tree Farm System, as compared with 10 percent of forestland worldwide. A single tree can absorb more than 10 pounds of C02 each year. In the U.S., forests and forest products store enough carbon each year to offset approximately 10 percent of the nation’s CO2 emissions. Private landowners in the U.S. plant about 4 million trees each day—five trees each year for every man, woman and child in America.